I use math a lot in my daily life. I’ve managed complicated budgets for several businesses (including my current job) and have been doing my own taxes (accurately!) for over a decade. Most of the time I’m in the grocery store I’m running numbers, determining sale prices, calculating total costs. Same goes for the kitchen — frequently I’m altering recipes, which requires an ability to do conversions on the fly. The only thing that tripped me up was modulus. In Zed’s words: “Another way to say it is, ‘X divided by Y with J remaining.’ For example, ‘100 divided by 16 with 4 remaining.’ The result of % is the J part, or the remaining part.” Okay. 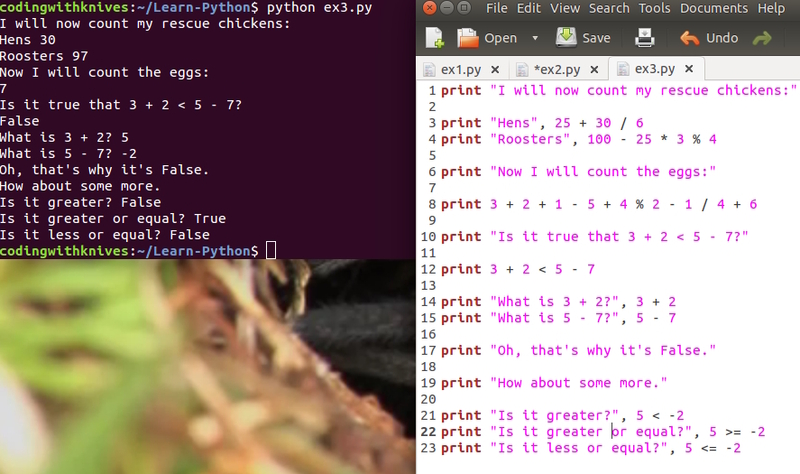 Next up, he has us write another little .py file that does some math. I couldn’t figure out anything I needed to determine, so I just made something up. I counted some hypothetical fruit. 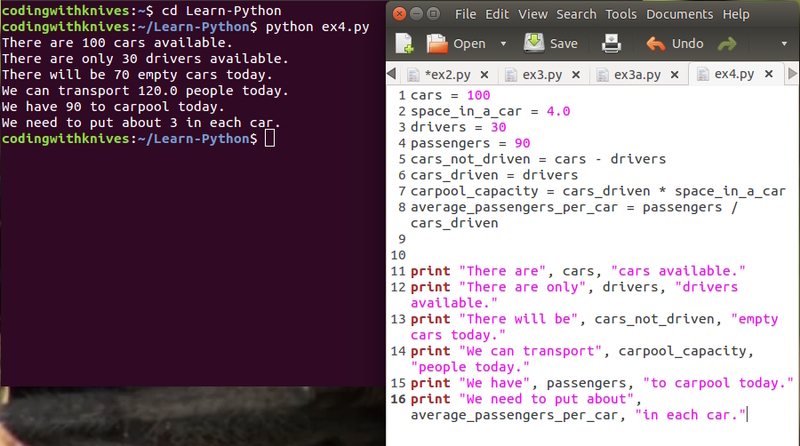 I’m looking forward to covering variables because I think it would have made my little example easier to write. 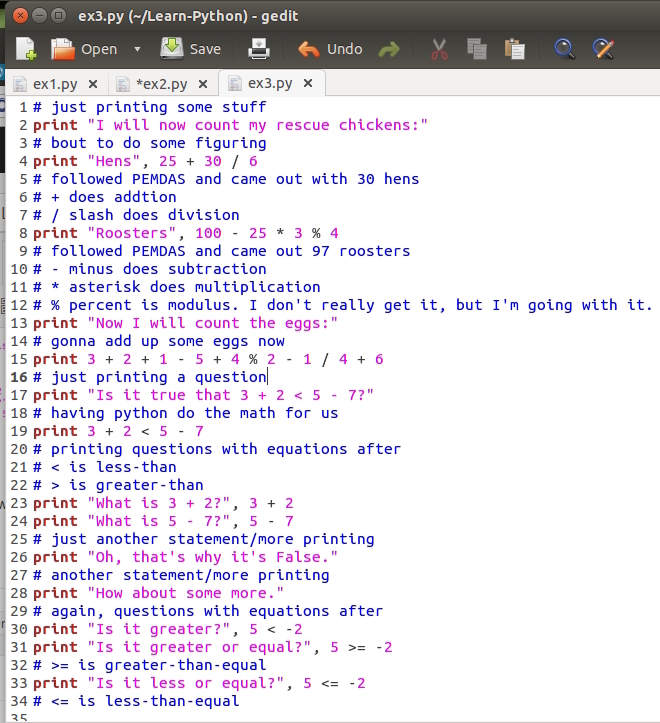 Finally, he stressed the importance of using “floating numbers” so I went back and re-wrote my little program to use them. Accuracy wasn’t an issue with this example, but it might be in the future, so floating point numbers seem like a good idea. 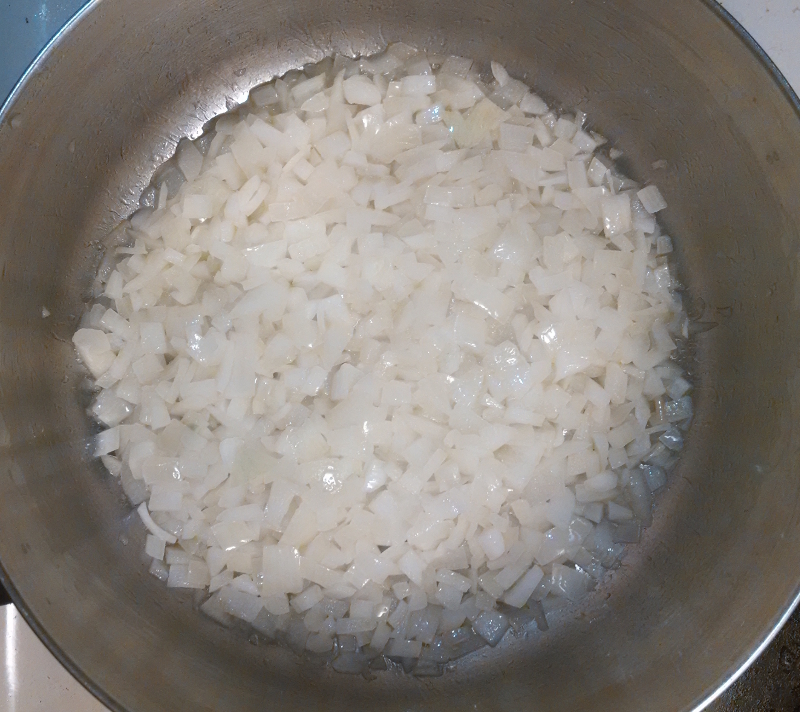 For today’s cooking basics lesson, I’m covering caramelized onions. Yesterday I made a pot of my favorite fordhook lima beans. The secret to their deliciousness is a generous base of caramelized onions. 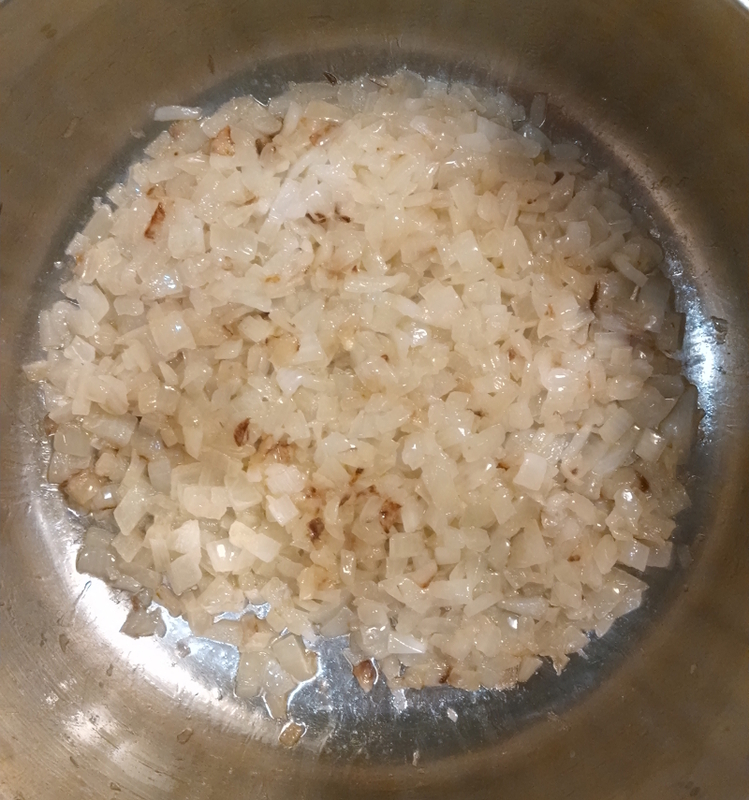 Caramelizing means cooking over low-ish heat for a long time in order to brown the naturally-occurring sugars in the onions. The formerly pearly-white cubes are transformed into a rich golden-brown (or deeper!) color with a rich, savory-sweet flavor. 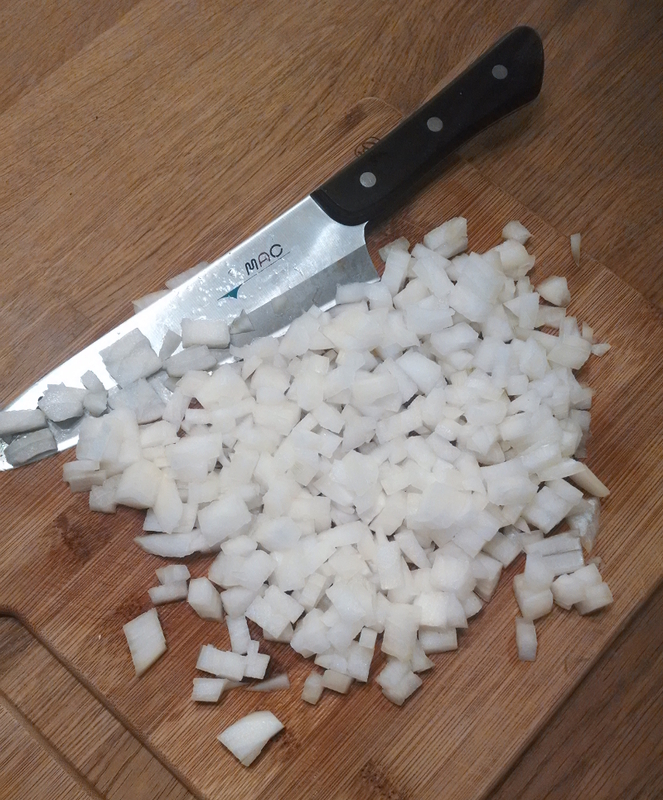 Start by uniformly chopping onions. A lot of folks go for long thin slices, but I wanted cubes. 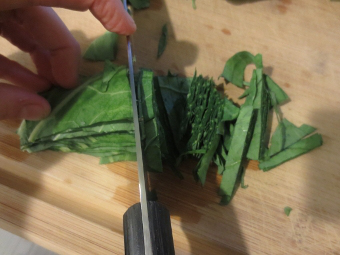 The small pieces look better than strands in the finished dish. Warm or melt your fat of choice over medium heat. I used Earth Balance margarine, but you could also use coconut oil or olive oil. 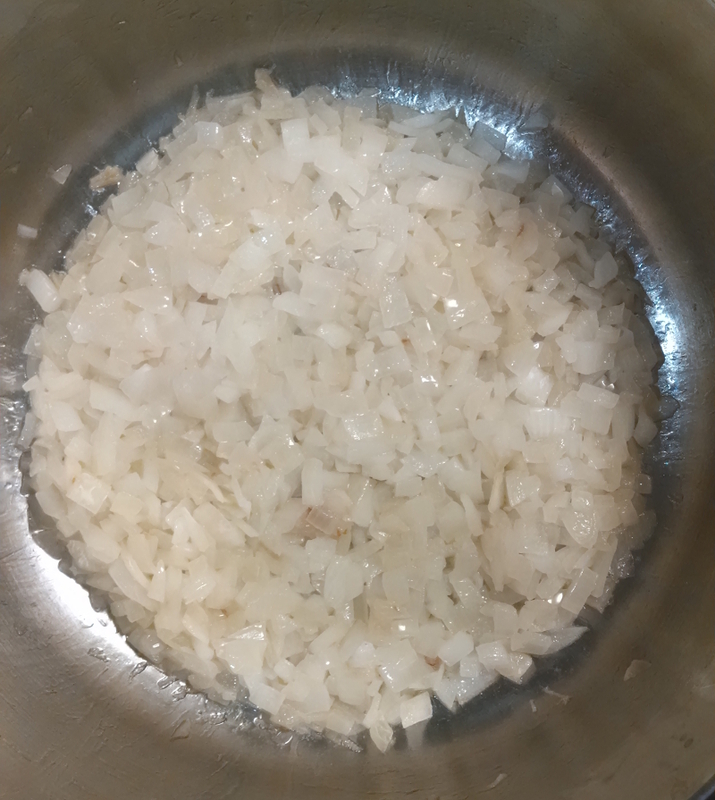 Stir to thoroughly coat onions with fat. After 10 minutes on medium heat. Use a stiff, well-made spatula to scrape up the bits of browning goodness. After 20 minutes on medium heat. Scrape scrape. After thirty minutes on medium. I turned it down to medium low. What a difference a little time and heat makes! 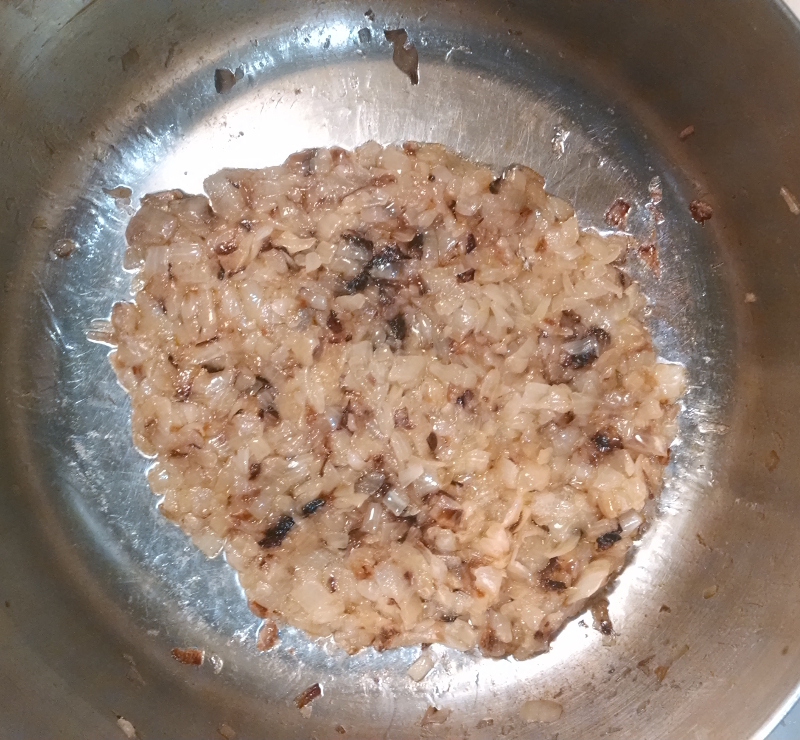 I did not add any salt, sugar, or liquids to enhance the caramelization process. 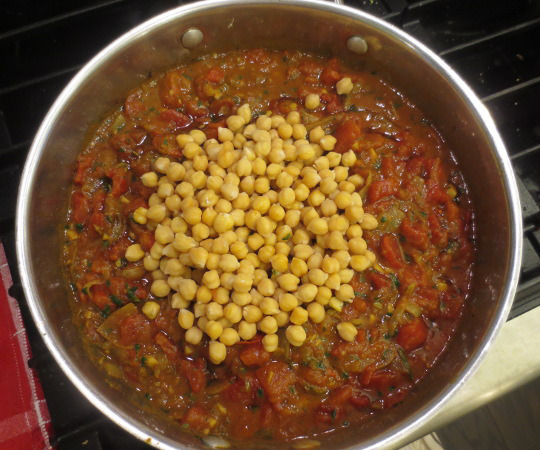 If you’re making a soup or a pot of beans, at this point you simply add other ingredients and simmer until fully cooked. 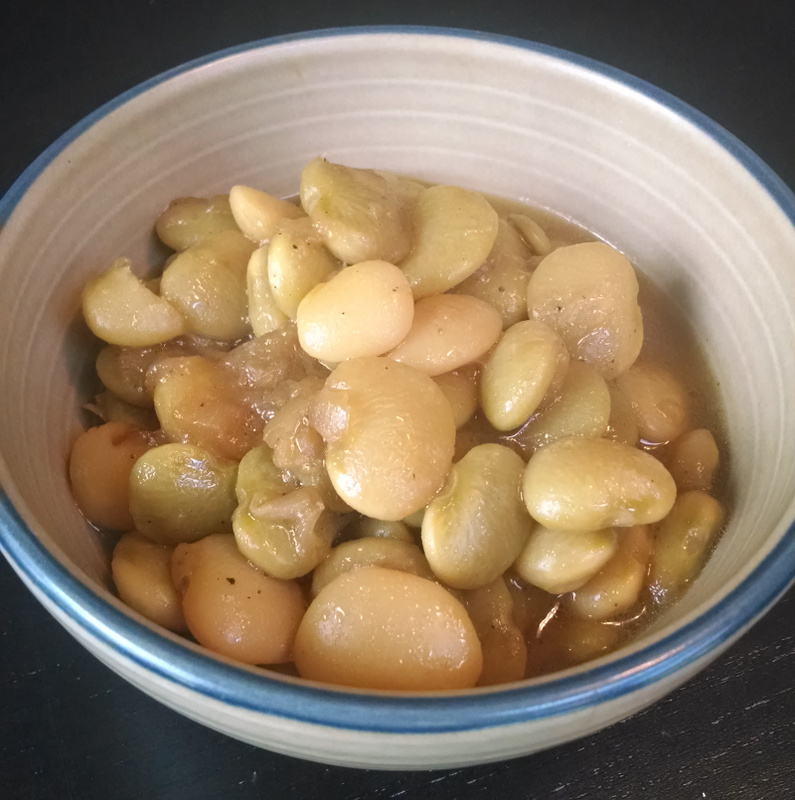 As I mentioned above, I used fordhook lima beans and simmered them until the broth formed a kind of rich oniony gravy. A perfect dinner! Exercise two is about comments. I already knew how to comment out code, so this was an easy one. Zed explains that comments are important because they give you a way to explain, in plain English, what something does. 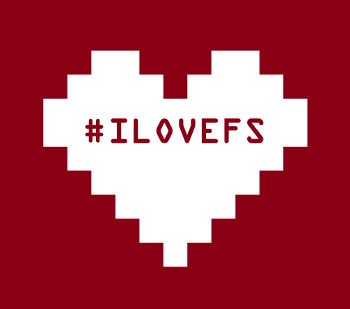 Comments help future readers of your code understand what’s going on. They also permit you to disable parts of your program if you need to. Comments in Python use the hash character (#, octothorpe), but today I learned that other languages use other symbols. I noticed this while reading Erik Dietrich’s post “Rapid Fire Craftsmanship Tips“. He gives a very specific example of when a certain type of comment is not so helpful. Taking time to document what I’m doing helps with the learning process — it makes things “stick”. This is exactly why Zed often suggests that we go back and write comments around seemingly easy exercises. It can feel tedious, but I still do it. In related news, “Very” Early Bird tickets for PyTennessee opened today and I got one! $50 for an earlybird ticket for a two-day conference is a steal, especially if I can find a couch to sleep on for the weekend. Hopefully I’ll be pretty far along in my journey by next February and will learn a lot from the experience. Please note that in this and any recipe, it’s incredibly important to use fresh, fragrant spices for the best-possible dish. I’ll cover proper storage of spices in a later post, but for now: if your spices smell like sawdust, they’ll probably taste that way, too. Toss ’em and invest in something new. Preheat one of your largest pans or pots over medium heat. I use a large, heavy-bottomed pan because I have one and it helps the tomatoes cook down faster, but if you don’t, you can use a large pot. Make your spice blend by combining spices in a bowl and whisking with a fork or small whisk. When the pan is hot, add coconut oil. Allow it to warm. 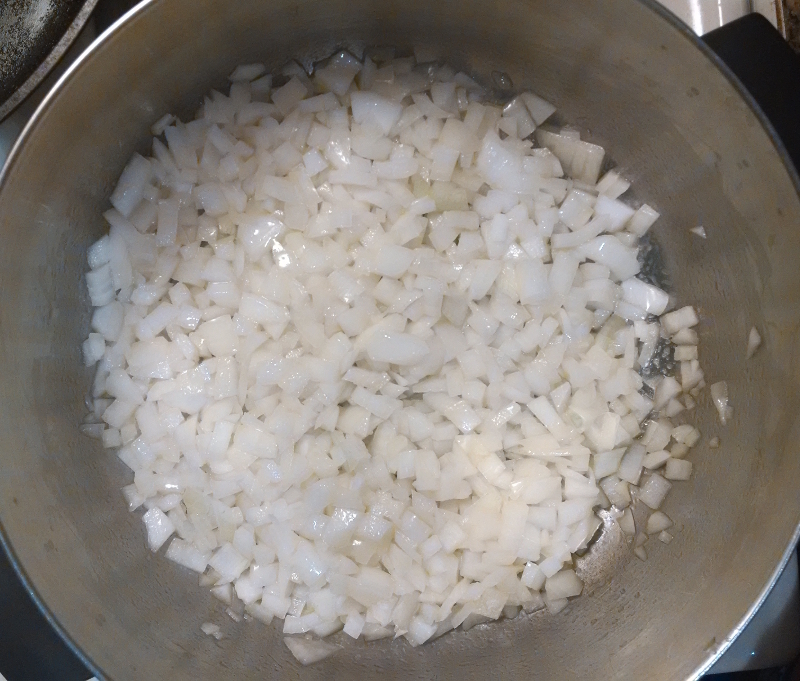 Add the onion (you should hear it sizzle) and cook about ten minutes. 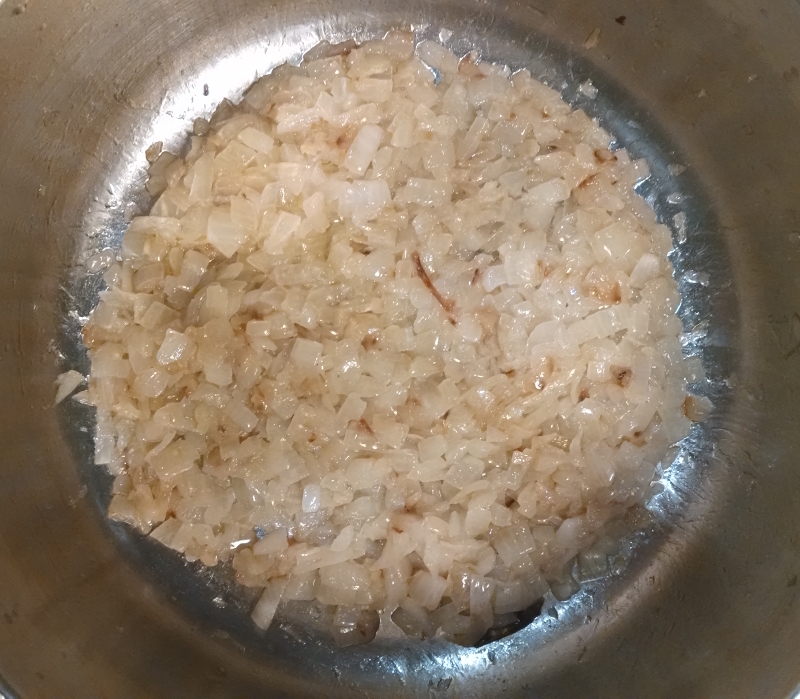 Onion will become soft and golden, and depending on how hot your pan is, may brown some. 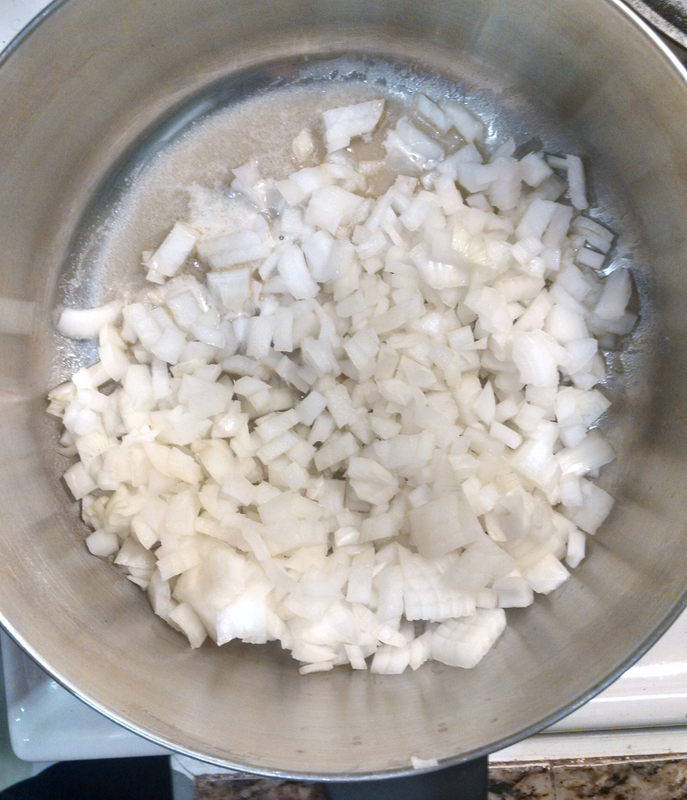 You may elect to leave the onions mostly undisturbed, or give them a good toss every few minutes or so. Just don’t burn them! After about ten minutes, add the hot pepper, garlic, and ginger all at once, and stir constantly for about 30 seconds to a minute. Add the spice blend and stir constantly for about another minute. 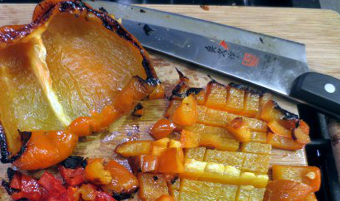 Make sure the onion-pepper-garlic-ginger mixture is thoroughly coated. Add the tomatoes and mix well, scraping the bottom of the pan to get all that sauteed goodness. 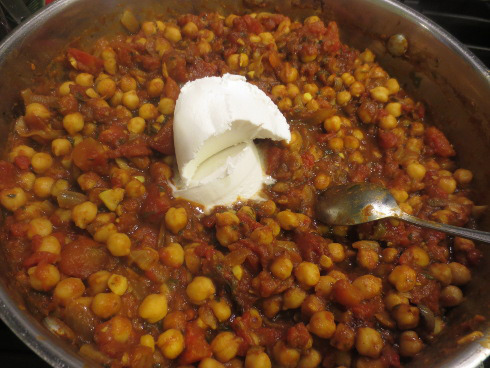 Add salt and chickpeas. Cover the pan and raise heat to medium-high, but once it has reached a strong simmer, uncover. Reduce heat to medium. Allow to simmer enthusiastically for about twenty minutes, stirring every few minutes or so. Be mindful of the heat – you don’t want anything to burn. 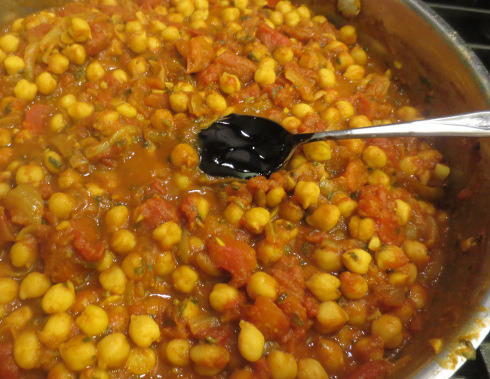 The point is to get the tomatoes to cook down so that the dish is thick and saucy rather than watery. 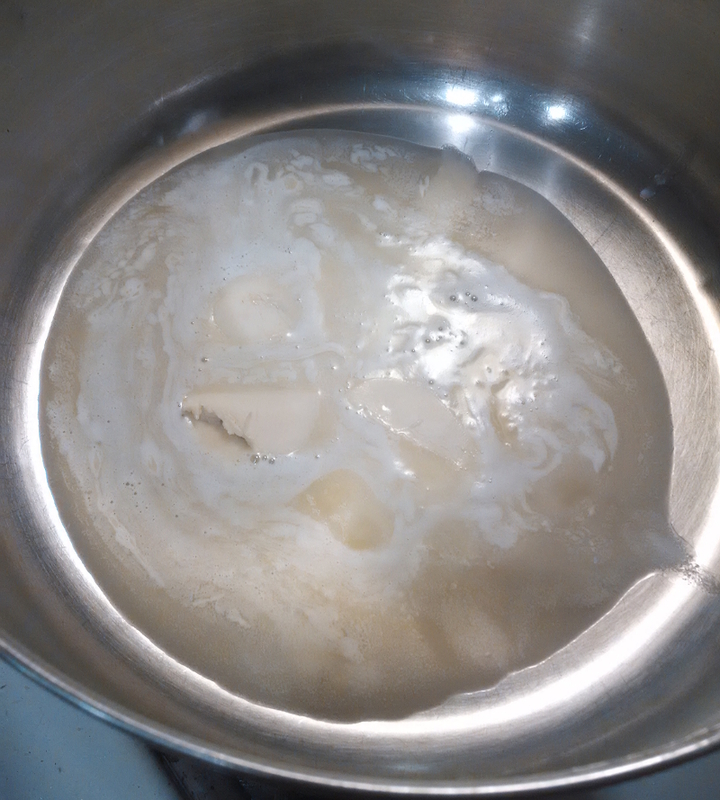 Once it’s reached a good consistency, stir in about a half a cup of coconut cream. You can use more. Creaminess is wonderfulness. Adding my secret ingredient – the coconut cream! Add the lime or tamarind and agave nectar. Taste for seasonings and adjust as necessary. Add cilantro if using. 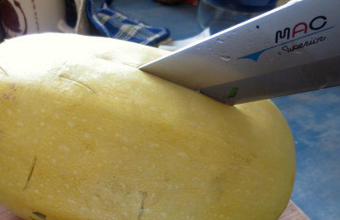 Remove from heat and allow to sit for about ten minutes. Thanks to Isa and Terry at the Post Punk Kitchen for inspiring me with this recipe.